7-1/4" Heavy Duty Circular Saw Kit, 120V, 2300 MWO, 5800 RPM, Rear Pivot Design For Greater Control, 50 Degree Bevel Capacity, Aluminum Shoe, Depth Of Cut Scale, 15A Motor, Kit Box, Includes Saw, Blade, Blade Wrench. 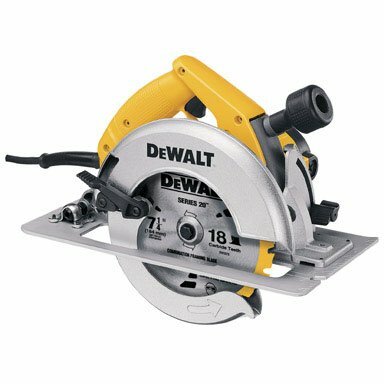 I researched a tested a number of circular saws before eventually choosing the DW364. I use the circular saw for light framing work, finish carpentry, and cabinet-making and I wanted a good, jack-of-all-trades tools that would be appropriate for the variety of projects I would use it for. After looking at comparable saws from Bosch, Makita, Hitachi, Porter-Cable, and Milwaukee, I short-listed the workhorse Makita 5007 and the DeWalt as the two that I would like to own. Initially, Makita's no-nonsense, field-proven design and reputation for reliability were winning me over, but I took a chance on the superior ergonomics and features of the DeWalt and didn't look back. There are two really standout features of this saw; the first is the precise and heavy-duty depth adjustment. Why don't other tool-makers build their saws this way? The stamped the sheetmetal rail and thumb-knob found on other saws is adequate at best, and unstable at worst. One of my 'tests' involved setting the depth gauge to it's shallowest setting, putting the saw on the floor, and leaning in to the handle with all my (220 lb) weight. Only the Makita and the DeWalt didn't deflect under this abuse, but the elegance of the DeWalt's design and the fact that the rear-pivot design keeps the attitude of the handle in roughly the same place, regardless of the depth setting, gave it a leg-up over the Makita. The second standout feature is the large and rigid hard-anodized aluminum shoe. The DeWalt's shoe appears to be about 30-percent bigger than those found on comparable saws and, unlike the Makita's die-cut aluminum shoe, the edges are machined smooth. Does this really affect the day-to-day performance of the saw? Probably not, but it is a nice detail. The DeWalt's shoe also appears to virtually scratch- and gouge-proof. I've seen my share of field-worn Makita 5007s to know that the their shoes are susceptible to gouging with use and abuse. For a framing saw, this is non-issue, but I'd hate for my saw to accumulate nicks and gouges that might scar the surface of finish cabinetry materials. Again, it is a nice detail that helps the DeWalt stand out from the rest. I tend to prefer cast shoes or even the stamped-steel ones found on many worm-drive saws but, as stamped aluminum ones go, this is the best. No saw is perfect, and this one has its faults. The chassis doesn't seem quite as sturdy or well put together as that of the Makita, but it is certainly comparable to those of the Bosch, Porter-Cable, and Milwaukee saws I looked at, and this saw is big and heavy for a sidewinder. But is seems to tackle anything you through at is with flying colors. Using the included 24-tooth framing blade it powers through wet 4X4s like a worm-drive; throw on a 40-tooth, thin-kerf Freud Diablo and you can precisely rip sheets of delicate 1/4" Baltic birch plywood with aplomb. This is probably the closest thing to the perfect circular saw you'll find. It has fulfulled all of my original purchase objectives and every time I use it, I am impressed with what a great design it is and how well it just works. If you only have room for one saw in your tool cabinet, I can't see how you'd go wrong with the DW364. Not bad, but not as good as I had expected. The height adjustment is rough, adjusting the blade for trueness is a total pain. They state that the blade is factory adjusted and ready to go. No way. When you try to adjust the blade to Zero degree's it has plenty of play in one direction but none the other way so you end up forcing the base plate to just barely get it straight. Could have done better on smoothing the metal, sounds like sand is in the works when you adjust the height. This is certainly one of the best saws I have ever owned. It has enough power to cut through even the wettest pressure treated wood without kicking back or bogging down. I checked the saw blade for square to the shoe and it was perfect. The bevel and depth degrees are clearly marked and easy to adjust. The saw is a little heavy but that can be an advantage when cutting sheet goods. I normally don't spend a lot of money on circular saws, but this saw is worth every penny. Very powerful and quiet. Super easy to adjust depth of cut. I bought another one of these to replace one that was stolen. It's bulletproof, dead accurate, and really really hard to break. I'm not a contractor, just a DIYer. This saw is probably too nice for me, but I love it. I cuts great with good balance. Ripping large pieces of plywood has never been easier. It does a good job of keeping the sawdust away from your face. The case is also convenient and built well. Go ahead and treat yourself to the last circular saw you will probably ever buy.